Bellingham Bouldering: boulders in Larrabee State Park. An area with many possibilities for new problems and unique climbing and bouldering compared to the rest of the Northwest. The sandstone here is amazing and worth the visit. 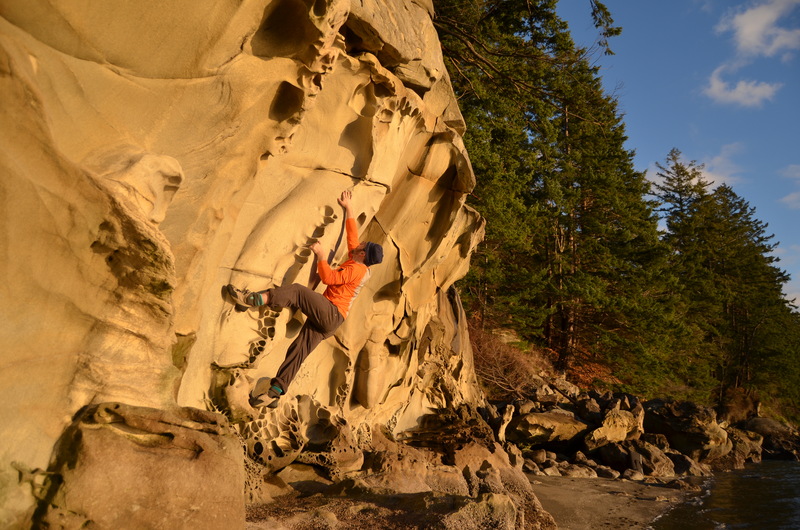 Enjoy the sandstone climbing at Larrabee. 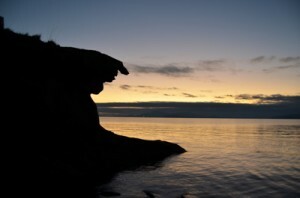 It is the most recommended area but is really spread out over a long shoreline. The first boulders are only a short walk though. Climbing is allowed in Larrabee and Bellingham. Do not cross the tracks to access the boulders. The park requests you walk south from the band shell to access all areas. Share some beta or photos with us from your last visit. It will help others to see what awesome sends you did and help the community to experience the area. Pros: Literally tons of rock. (and I’m not even using literally wrong here). 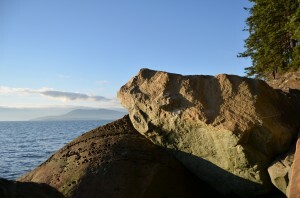 The Bellingham Bouldering scene is not as popular as Leavenworth or up in Squamish; the bouldering and rock type is equally as polar. This little town nestled on the Puget Sound in Northwest Washington has some of the most unique pocketed sandstone anyplace in the US. The sandstone, called Chuckanut Sandstone, is quite different from the mass granite empire found in the rest of the state, or even the basalt that is typical in other parts of Washington. 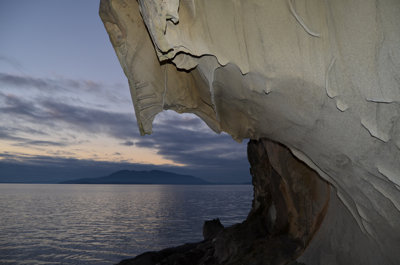 The boulder problems are just as different: Hueco roofs, finger pockets, and massive stone swirls are found all along the shore at Larrabee State Park. If you are looking for a very different type of climbing in Washington, this is the place to go. The sandstone is very good quality and the problems are excellent. 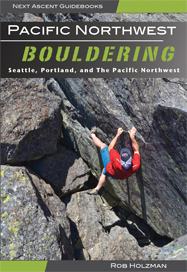 The main areas to boulder are Sehome Hill, Chuckanut Drive/Larrabee State Park, Fragrance Lake and Cleator Road. 1. 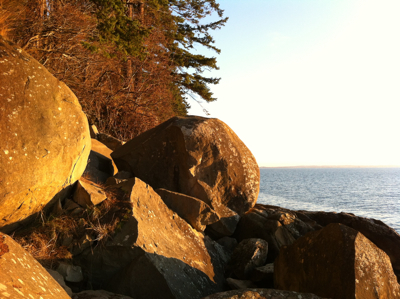 Larrabee – Great bouldering and some of the best rock in Bellingham. 2. Sehome Hill – Boulders right behind the Western Washington University campus. Can’t beat the access. 3. Fragrance and Cleator – Hard problems and fun lines but not as clean as other parts of Bellingham. 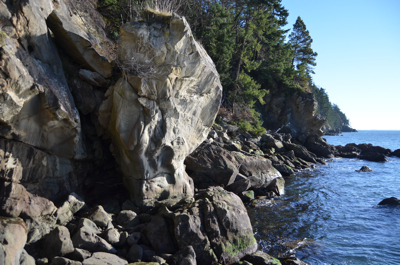 The Fang boulder at Larrabee State Park.